Distance from the Liberty Stadium: 150 miles ~ 3 hours 15 minutes. 3,000 away fans are in both tiers of the Doug Ellis Stand, by the side of the pitch rather than behind one of the goals. A good choice of food; pies, burgers and chips. TVs are on the concourse, and before the game they show past games between the teams, also a betting outlet. Carlsberg and Somersby cider is only sold in the lower tier. 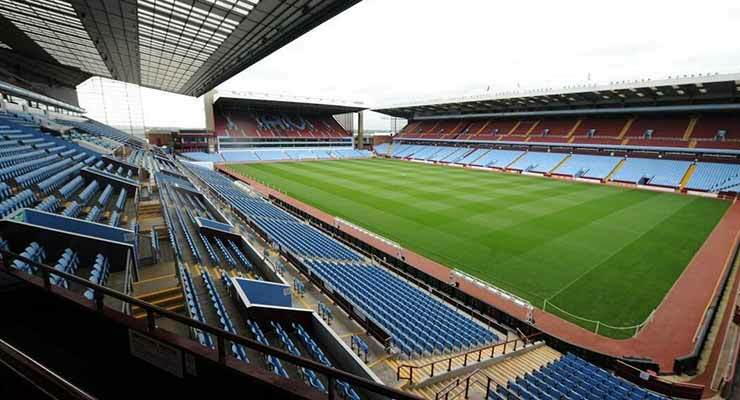 A visit to Villa Park is normally great, with relaxed stewarding and a very small area separating home and away fans gives a good atmosphere. The UK’s second largest city has hundreds of hotels and B&B’s and a multitude of eating and drinking places to suit every appetite. Ethnic food is highly popular and every part of Asian cuisine is represented. Birmingham has it all, from malls to shopping centres to independent shops. The Bullring (B5 4BU) is probably the best known and has over 160 shops on one site along with plenty of places to eat or drink and there are plenty of museums, art galleries and theatres worth a visit if you plan on making a weekend of it. There are plenty of hotels to choose from to suit a range of budgets. The Barclaycard Arena (B1 2AA) has Vitality Netball Superleague Super Ten on the Saturday from 11:00 with all 10 teams playing. Tickets are £12.50 – £69. The O2 Academy (B1 1DB) hosts Catapult featuring Sketch on the Friday; tickets are £7.90. The Saturday night, CityLightz are there; tickets at £6.75. Birmingham has a National Sea Life Centre (B1 2HL). Tickets bought on-line at www.visitsealife.com/birmingham/ are £12.50 (on the day £20.95), under 3’s free. Entry to the 4-D film 20,000 Leagues Under the Sea is included. It’s open 10am-6pm. Cadbury World (B30 2LU) is worth a visit for any chocoholics. You can save 5% of the entry cost by booking on line at www.cadburyworld.co.uk. StarCity complex (B7 5SA) has a Vue cinema, ten pin bowling (3 games for £7 on Sundays), mini golf (£19.99 for a family of 4), laser station, a football centre, gym, casino, a climbing centre. The seasonal ice rink is open until the night of the game. There’s free parking and it’s a 1.5 mile walk to the ground. Most pubs around Villa Park are members only or have security staff on the door. The Witton Arms (B6 6SN) charges £2 entry and half the pub is for away fans (with a door for away fans). Its 0.2 miles from the away entrance. Yew Tree (B6 7AS) is 0.6 miles away and welcomes away fans. If you arrive early the historic Bartons Arms (B6 4UP), is 1.8 miles away. This Grade 2 listed building, is one of Birmingham’s finest pubs, with superb Victorian decor, selling Oakham ales with Thai food on offer. Ruskin Hall Social Club (B6 5HP) is closed but parking is available at £5, and street parking in the road adjacent to the club if you arrive early enough. It’s a 10 minute walk to the ground through Aston Park, and a really quick getaway after the match that avoids the congestion at the final whistle. The entertainment complex StarCity (B7 5SA) is 1.5 miles away and just off the M6 at J6, going towards Villa Park. It has a free car park for 2400 cars, with plenty of food and drink outlets. Amongst others are KFC, Subway, Pizza Hut, Nando’s, Bella Italia, McDonalds and Harvester. Mostly street parking, but be wary of residents only parking around the Witton roundabout area. You can also choose from a selection of private car parking spaces near Villa Park – including on-street parking, off-street car parks and 30 reservable spaces. 5 minute trip from Birmingham New Street are Aston (0.4 miles from stadium) or Witton stations (0.6 miles from stadium). Witton is nearer the away end. Turn left out of the station and down to a roundabout. Turn left at the roundabout into Witton Lane; the away entrance is down this road. Aston station is a 10 minute walk away. On match days, extra trains are put on. Trains leave Swansea at 07:29, 07:59, 08:29 & 09:33 for the 3 hour 40 minute journey to Witton. Coming back, the 17:17, 18:17, 18:47 & 19:17 get back to Swansea at 20:42, 21:43, 22:20 and 22:44 respectively.